This is an interview with Dana Walters, co-founder of Project Yoga Richmond. Dana told me that she took her first group class in 1994, but yoga didn’t immediately “grab” her the way it can newcomers; it took several years. She started Project Yoga Richmond, a non-profit organization, in 2010. What drove the inception of Project Yoga Richmond was a confluence of events: with an inheritance from my grandparents, I acquired a building suitable for a studio space. A beloved yoga teacher had passed away just a year before, and I, along with several of her students who are also yoga teachers, wished to carry her vision forward to serve our local community. Our weekly studio classes, donation-based and open to all, support our offsite outreach yoga classes for under-served groups. The demand for service through yoga continues to increase. We receive a dozen or so requests each quarter for ongoing or seasonal classes for individuals in need. While we have expanded our studio offerings and offer workshops and continuing teacher education, our emphasis has shifted more and more to service, thanks to the support of our students and donors. We currently have over 50 active teachers and volunteers working together. Is there a standout moment from your work in your local community? There are so many inspiring examples of transformation from the past five years: for instance, a woman who shared with me that yoga has brought her daughters and her closer because they can all afford to practice together at our studio. There is a student in long-term unemployment who leaves notes of appreciation for us and our supporters, because of whom she can continue to attend despite her financial circumstances. We know a woman in recovery from addiction who finds a spiritual home at our studio, and a volunteer who said he finally learned how to breathe. Another story is from a fixed-income senior in our outreach classes who is finally able to reach the back of her head to dye her own hair! We have children with autism learning to “Om” together. Finally, we have teachers and students from all over the community, with different backgrounds, joining together to give back the practice that has brought them so much. What did you know about Richmond before you began Project Yoga? What were some of the assumptions you had about the community, and how have those assumptions changed? What has really moved me is the interest in yoga and the sustained support of our students. 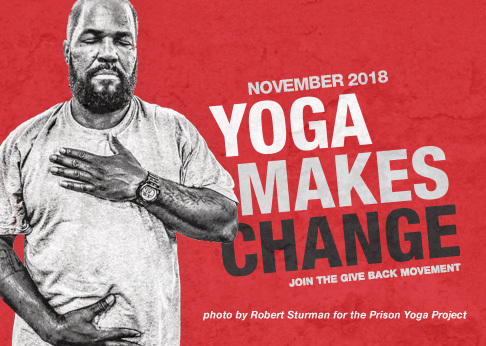 Since our inception in late 2010, we’ve come to roll out 1200-1600 yoga mats each month to individuals of all abilities across our community: young people with autism, seniors in marginalized areas, incarcerated young women, adults with developmental delays, kids in city schools, people in addiction recovery. What are two ways that teaching in a studio might differ from teaching to communities in need, and what are the reasons for these differences? Skill and humility are paramount in teaching in outreach programs. A teacher must be prepared, have all the tools in his or her tool bag, so to speak: know how to modify poses creatively, teach many types of practices other than asana (postures) useful to people in need, emphasize that yoga is so much more than the images that are often presented in the media. A teacher engaging in service must also, with humility, be willing to change his or her plan based on the needs of the community. This humility is required to teach any class, even more so when serving those with a variety of physical and mental barriers or challenges. What has been the greatest challenge in your work with PYR, and what tools have you developed for addressing that challenge? Balancing growth with sustained support is always a challenge. We constantly ask ourselves how large a reach we want to have. At times, the possibilities seem limitless. Maintaining fiscal strength is very important. Bringing in board members, staff, and volunteers with fresh vision, great ideas, and an inclination toward mindful teaching, diversity, and co-creating responsible yoga culture has been a growing focus recently. What advice would you give to anyone who is going to engage in service work, or start a non-profit organization? Have the willingness and humility to learn as much as you can — to remain a student, always. Bring new resources into your community: reach out to individuals with skills you don’t currently have, and listen to what they have to say. They can help you find innovative ways to stay true to your core vision and mission as you grow. Continue your self-care practices. Keep gratitude at the forefront of your mind and heart! I hope the conversations the Yoga Service Council has started regarding mindful community and responsible, compassionate culture continue to evolve. I hope those in the U.S. who are teaching and practicing yoga will stay curious about what it means to work from the heart of yoga rather than at the surface of it! “All yoga” could be “service yoga.” We must create safe, inclusive spaces in our studios and classes. We would also do well to keep learning about our students, the communities we serve, and their needs. We should continue to care for ourselves as we serve others. We can create supportive professional groups we can call on when in need. We can use social media responsibly. There are some beautiful images out there. We can ask ourselves: do these images encourage the deeper exploration of yoga as a transformative inner practice? This is a challenge those of us practicing an ancient art while living in the modern technological world must try to explore. Regarding service, I’m most inspired by action! I remember the famous quote from the Indian poet Rabindranath Tagore: “I slept and dreamt that life was joy. I awoke and saw that life was service. I acted and behold, service was joy.” Everyone, no matter what circumstance or background, has a skill or service to offer, even if it’s just presence and attention. Yoga empowers us to attain clarity on what it is we can accomplish in this world, what’s beyond our control, and where our energy is best spent. This frees us up to serve in the ways we feel most useful. Are you interested in supporting outreach to underserved populations? Make a commitment to serve by joining the Give Back Yoga membership program today.